Dragon Age: Inquisition is set to feature a character named Dorian, who is an openly gay pariah from a land where perfection is the only option. David Gaider of Bioware designed this character to add an extra dimension to the game, a further degree of reality and immersion. 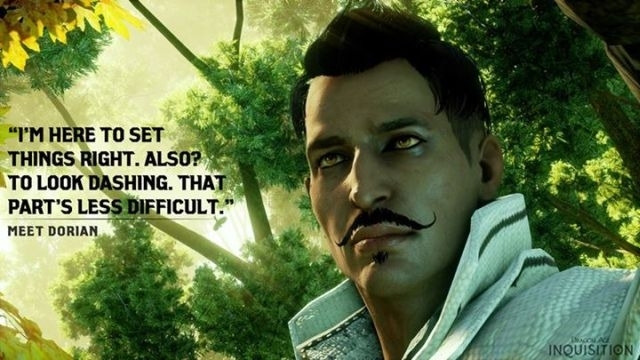 Players can choose to become Dorian, or play as a different male character in which a romantic relationship is possible should the player wish it. Other gay and bisexual characters have been in Dragon Age titles previously, but have been featured only as more minor set pieces. Dragon Age: Inquisition will be released October 7th, 2014 for Xbox One, Playstation 4, Playstation 3, Xbox 360, and the Personal Computer.